Borneo is the third largest island in the world and is known for its beautiful yet endangered orangutans and pygmy elephants. It is also home to thousands of equally beautiful stray dogs that struggle for survival on a daily basis. Stray dogs in Borneo suffer in a number of ways: many fall victim to cruelty or suffer as a result of wounds inflicted through fighting or road traffic accidents; many suffer from skin problems and diseases, including parvovirus and distemper, which are rife throughout the region; and whilst the eating of dog meat is not as widely practised as in other countries it still poses another threat to the life of a street dog. This is all in addition to the everyday difficulties faced with trying to find regular food and a safe place to sleep, writes Karen Churches Peacock. It's believed there are 10,000 stray dogs living in Kota Kinabalu, the capital city of Sabah and one of the fastest growing cities in Malaysia. Located on the northwest coast of Borneo, facing the South China Sea, Kota Kinabalu has a population of circa 452,000 and is a major industrial and commercial centre as well as a popular tourist destination. It's this which led Nicky Stevens, from Buckinghamshire, England, to first visit Kota Kinabalu in 2009. Although she quickly fell in love with Borneo, she was saddened to see so many animals suffering as a result of cruelty and neglect and these haunting images stayed with her. Upon her return to the UK, Nicky made a commitment to do everything that she could to help create a better future for the animals whose lives were filled with so much sadness and within a year she had formed IAPWA. In July 2014, following four years of negotiations with the local government, Kota Kinabalu City Hall handed over management of the local dog pound to IAPWA. Following this appointment, the organisation quickly replaced the previous methods of population control with a more humane neutering and veterinary care programme and this change marked the start of a very exciting journey in the improvement of animal welfare within the country. Sadly, in many countries around the world inhumane methods of dog population control are often practiced. In addition to the obvious suffering that this causes the animals, these methods rarely address the underlying problems regarding strays. When a stray dog becomes an IAPWA patient they are neutered to prevent unwanted puppies being born and subjected to a life of cruelty and neglect. They are also vaccinated against diseases and given any additional veterinary treatment needed. When fully recovered, the dog is released at the exact location where it was found. In addition to managing the dog pound, IAPWA provides a rehoming service to dogs that are unable to cope on the streets. The charity also engages with and helps educate the local community about responsible pet ownership to try and better the lives of dogs now and in the future for generations to come. Snowy was discovered struggling for survival on the streets of Kota Kinabalu. She was emaciated. She had lost most of her coat and was also suffering from an eye infection. Her life was made all the worse by having to cope with a disability to her feet. After receiving veterinary treatment from the team, Snowy eventually recovered and was found a permanent home with a kind animal lover in a beautiful house overlooking the city. Delighted that Snowy was rescued from her harsh life on the streets, the IAPWA team continue to visit her and are thrilled to see how happy she is in her new home. IAPWA recently conducted a public opinion survey to better understand people’s perception towards street dogs in Kota Kinabalu. All those surveyed agreed that there was a stray dog problem in the city and wanted to see a reduction in the number of strays on the streets of Kota Kinabalu. Many viewed the dogs as being a nuisance and the majority of complaints related to noise, fouling and disturbing rubbish bags outside properties while the dogs tried to find something to eat. Although all of those surveyed wanted the street dogs to be neutered and rehomed, no one who took part in the research said they would be open to rehoming a dog and this highlights the imbalance with what people define as being the ideal solution and the reality. This is where the challenge lies as IAPWA now needs to increase the number of people looking to rehome whilst also improving the perception of stray dogs on the street. It also remains an ongoing challenge to ensure the welfare of each dog it releases back to the streets and identify where necessary alternative solutions for any dog it deems as being in danger if placed back into its old environment. Later this year, IAPWA will conduct a follow-up survey to gauge the differences its education programmes are making and to measure the change in perception towards street dogs. The work doesn't end here though. Thanks to its supporters, IAPWA has been able to provide veterinary care to more than 1,100 street dogs that would have otherwise suffered in silence: over 1,038 dogs have been neutered; a further 78 dogs have received additional veterinary care and treatment for a range of wounds, injuries and disease; and 252 puppies and adult dogs have been rehomed with local, loving families. In recognition of its work in Borneo, IAPWA was recently awarded the title ‘Charity Team of the Year’ at the Ceva Animal Welfare Awards 2015. 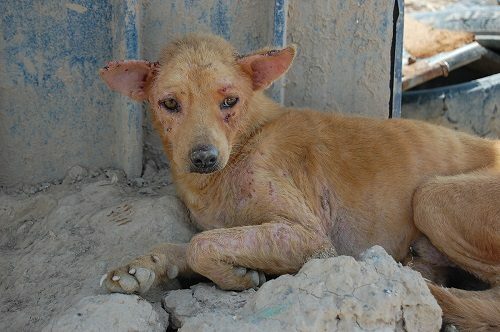 As there are approximately 10,000 stray dogs in the Kota Kinabalu region alone, IAPWA urgently needs to double the size of the dog pound so that it can increase the number of dogs it treats through its neutering and veterinary care programme and help improve the lives of many more street animals. The dog pound expansion project will cost a total of £10,000. Thanks to the generosity of two supporters in Kota Kinabalu, IAPWA has just constructed the concrete slab foundation and completed the first phase of works. The charity now needs to raise £8,500 to pay for phase two of the project - the purchase and installation of the roof and 30 dog cages. It desperately needs the support of animal lovers around the world to help fund the second phase of works - just 30 donations of £285 will fund the remainder of the project, as will 850 donations of £10. Karen Churches Peacock is the Director of Fundraising for International Aid for the Protection & Welfare of Animals (IAPWA). To support the IAPWA Borneo dog pound expansion project and make a donation online please visit http://campaign.justgiving.com/charity/iapwa/IAPWA-dog-pound-expansion-appeal. To make a donation by text* please text IAPW01 £10 to 70070 to donate £10. To make a donation by cheque or bank wire transfer please email karen.peacock@iapwa.org for details. To find out more about IAPWA please visit www.iapwa.org, or find us on Facebook or Twitter. * This option is only available to IAPWA supporters based in the UK. There is no cost for sending the text and the donor’s free allowance/bundle will not be affected – the only charge will be the donation itself which will be added to their mobile phone bill or deducted from their pay as you go credit. IAPWA will receive 100% of the donation, including Gift Aid. If you would like to share your own 'a view from' story, please comment and contact us below!